Welcome to another installment of a segment where we dive into one Elder Scrolls Online’s many Sets, and explore what sort of Builds you can make. Not only will we show you how to get the most from these Sets, but we’ll explain where to get them, what requirements there are to obtain them (if any), and everything else you could possibly want to know about them. In this article we will take a look at Curse of Doylemish Set which increases Melee Heavy Attack damage against taunted, stunned or immobilized enemies. This Set was added to the game with Dragon Bones DLC. It launched on PC/Mac on 12th February 2018 and Consoles on February 17th 2018. Dragon Bones introduced two new dungeons (Scalecaller Peak and Fang Lair) which are Norse-themed. This Set drops in Scalecaller Peak, which is located in Stormhaven. Each Set item is bind on pickup, meaning you will have to participate in that Dungeon in order to obtain this Set. 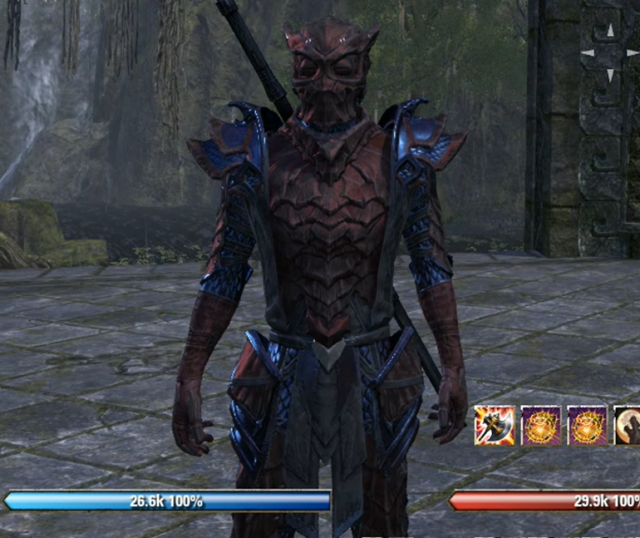 You can acquire heavy armor, weapons and jewelry of this set in the Scalecaller motif style. The Scalecaller motif has a chance of dropping from the last boss in Veteran Scalecaller Peak, and can be also purchased from Crown Store. Weapon and Armor Traits are random, meaning you are likely to have to farm pieces for different Traits. This is a Heavy set so enchantments on Armor are and Weapon pieces are Max Health and Absorb Health. Jewelry comes with Healthy Traits and Health Recovery Enchantments. Keep in mind that you can use Transmutation to change Traits if you wish, however the Summerset expansion is needed, along with 50 Transmute Crystals. Curse of Doylemish adds around 2400 Max Health, 129 Spell and Weapon damage with the first 4 piece bonuses. The 5 piece set bonus adds 12040 Physical Damage to fully-charged melee Heavy Attacks against taunted (monsters), or any enemy that is stunned or immobilized. This effect can occur every 7 seconds. 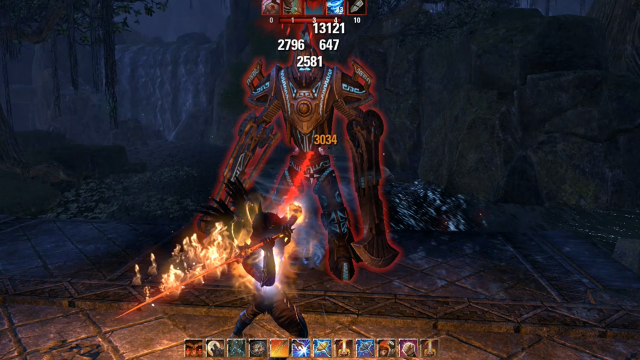 Light and Heavy Attacks are basic attacks that anyone in Elder Scrolls Online can perform, regardless of Race or Class. They don’t cost any resources, and fully-charged Heavy Attacks will even restore Stamina or Magicka based on the Weapon used. Some things to note about Heavy Attacks are: the longer you hold down the attack button to perform a Heavy Attack, the more damage you will deal, capping out at “fully-charged”, and Heavy Attacks that are not fully-charged will NOT return resources. Both Light and Heavy Attacks also cause you to gain Ultimate, so continuously striking with them will be sure to increase your Ultimate up-time. This Star maxes out at +35% Damage. 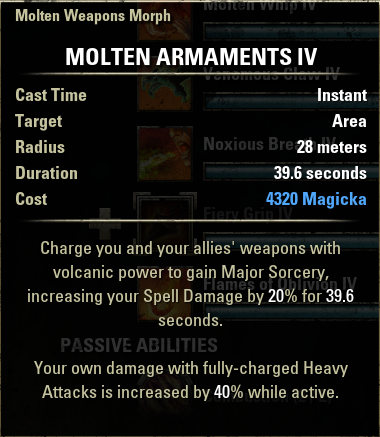 The damage for Light and Heavy Attacks is increased by Max Stamina and Weapon Damage for all Stamina-based Weapons, and Max Magicka and Spell Damage for Magicka-based weapons (Staves). Light and Heavy Attacks have a 10:1 ratio, meaning you would need to add 1000 Max Stamina or Magicka to get the equivalent of 100 Weapon or Spell Damage. 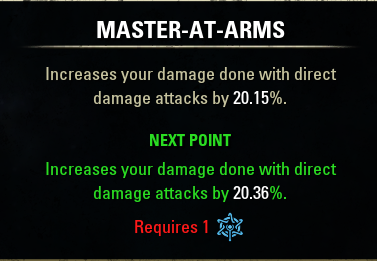 This means when you are making a build that focuses on Light or Heavy Attack damage it doesn’t matter if you prioritize Stamina or Weapon Damage /Magicka or Spell Damage, they will roughly contribute the same. Heavy Attacks (not fully-charged): Somewhere on a scale in the middle depending on length of time the button was held. Another important thing to note is that performing a Heavy Attack against an Off Balance enemy will deal 70% more damage, return 100% more resources if it is a fully-charged Heavy Attack, and leave the target Stunned. 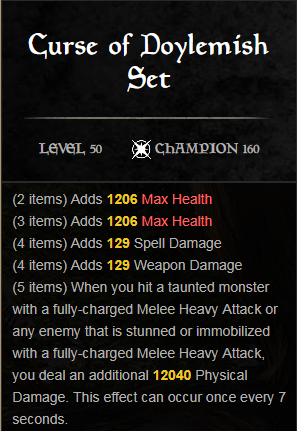 How this set works is that whenever you hit an enemy with fully-charged melee heavy attack that has been stunned, immobilized or taunted (monsters only), you will do an additional 12040 Physical Damage. When this effect occurs there will be noticeable red lasers fired from your eyes. Note that this proc can only happen if you are wielding melee weapons, even though in a previous version of the game it could work with Staves. Using Staves from up close will not trigger the effect, and melee actually refers to melee weapons only. 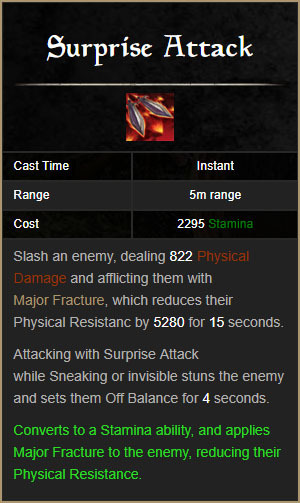 What is strange is that Staves can still drop, even though they cannot benefit from 5 piece Set bonus. Set bonus procs when using heavy attack on stunned, immobilized or taunted target. For the proc to occur, you need to be in striking distance of your melee weapon. If you cannot reach the enemy, the effect will not trigger. 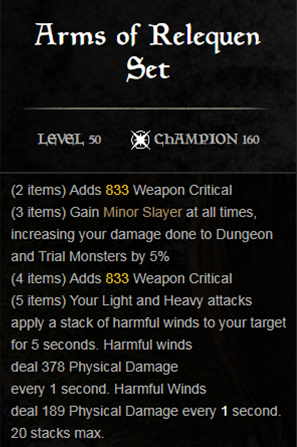 This is damage from a set bonus so it cannot Crit and is not affected by Weapon/Spell Damage, Stamina/Magicka, Brutality, Molten Armaments or any other Heavy Attack damage boosting method. However, it can still be increased in damage. 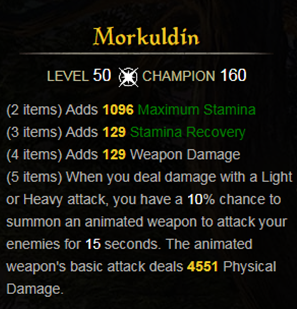 Tooltip damage can be increased to maximum of 16268, and it is affected by Mighty and Master-at-Arms Champion Skills. Sets like Undaunted Weaver or Queen’s Elegance that boost Heavy Attack damage do not affect the damage of 5 piece set bonus. Consider also investing into the Piercing Champion Skill instead of maxing out Mighty and Master-at-Arms. 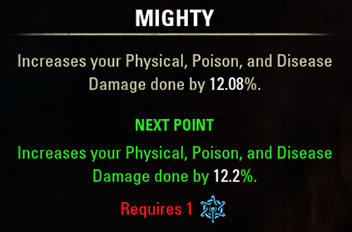 With 100 points into Mighty and Master-at-Arms the Set did, in my case, around 10700 Damage. With 56 points into Mighty, Master-at-Arms and Piercing, that Damage rose up to 11400. If an enemy is Off Balanced, the Heavy Attack bonus from the Set will increase by 10% if you have the Exploiter Champion Skill, but will not be increased by the 70% that your Heavy Attack damage will do. This means that while your Heavy Attacks will still hit much harder, this Set isn’t as potent as it could be if it gained this benefit. This set can be used on Tanks and DPS Roles, because if Tanks want to hit harder then this Set is perfect for it. As a frontliner you have all the necessary tools to stun, immobilize, off balance and taunt enemies so you can easily benefit from it. Especially when considering that Tanks in between those 7 secs need to help themselves stay alive, so doing the Heavy Attack every 7 secs or so to restore some Stamina is doable. Combine something like Ulfnor’s Favor and the Tenacity Champion Skill to restore a lot more Stamina per Heavy Attack to increase resource sustain considerably. Heavy Attack Stamina DPS builds are still viable and can produce serious damage, and you can use any Dual Wield or Two Handed weapon for Heavy Attack builds. Both skill lines have ways of increasing damage so that it works well with Heavy Attack builds, and one thing that’s particularly interesting is that the damage from this Set will hit up to two nearby targets with the Forceful passive from Two-Handed Skills. This means if you roll through some enemies, and set them Off Balance with Tactician, then root them and do a Fully-Charged Heavy Attack you will do a ton of damage to 3 targets! 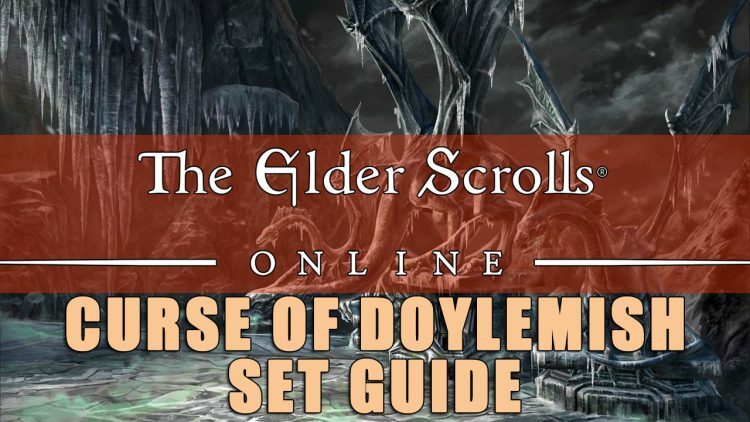 Sets that work great with Heavy Attack builds and can work in conjunction with Curse of Doylemish are Selene’s Web, Undaunted Unweaver, Sunderflame, Arms of Relequen and Morkuldin. All of them proc from Heavy Attacks and do additional damage. Selene’s Web works fantastic with all of them since it can proc from their proc, which is brutal when it happens. Curse of Doylemish works better in PvP then in PvE where burst damage is king. It is not the highest instant damage you will see but it definitely helps, especially for Tankier characters who can’t do enough damage to take out other players quickly. Consider using this Set if you plan to play in Heavy Armor, but need a bit of a damage boost. Nightblades can be devastating with this set. Using Surprise Attack Stuns and Off Balances players, which is perfect for this set since it procs only if player is Stunned or Immobilized. Not only will the damage proc with a Heavy Attack, but it will also deal 10% more damage thanks to the Exploiter Champion Skill. Following up a Dizzying Swing with a fully-charged Heavy Attack can cause great damage very quickly. In addition, if you use the Radial Uppercut Set, not only can you Stun two targets, but then you can get the splash damage from the Heavy Attack afterwards hitting both! 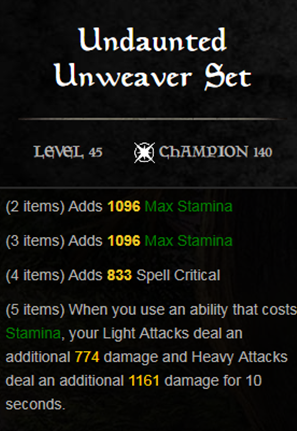 Magicka Builds won’t find much use from this set since it works only with melee weapons, and while you could equip a melee weapon on your back bar, there are better options, especially for PvE content. Stamina Builds are really the only players who will utilize this Set. The Tactician Champion Skill works against Bosses, enemies and players alike, making it a must for any Build focused on Heavy Attacks. Avoiding attacks by using Dodge Roll will put any of them Off Balance for 5 secs. It is a short period but you can utilize it for some additional damage, and Tanks should get in the habit of doing this once every 20 seconds anyway. Werewolves can use this set to great effect. They can set enemies Off Balance by using Roar, and then do a Heavy Attack for increased damage and resource return. Werewolves gain +100% resources back from fully-charged Heavy Attacks, so they make good candidates for any Set that revolves around Heavy Attacks. 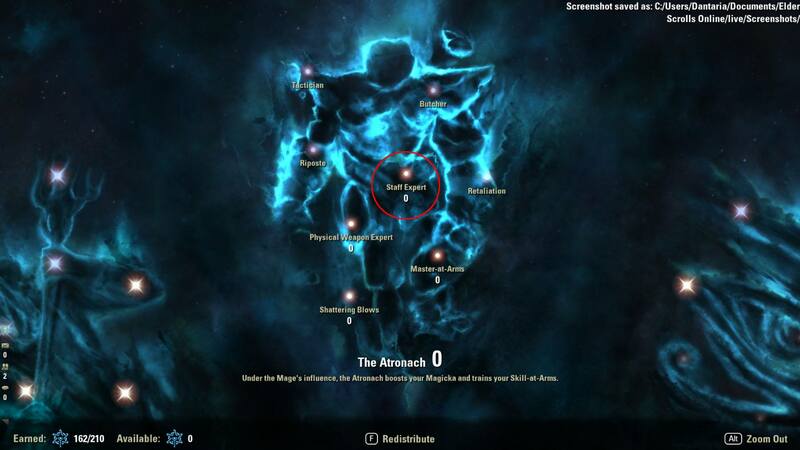 Stay tuned as I’ll be covering the rest of the ESO Sets, and be sure to check out our other ESO Guides! Senior Editor at Fextralife. I enjoy gaming, playing and watching sports, cooking yummy food, watching a good movie and hanging out with Fex.